We at LR Landscaping & Pavers provide a variety of landscaping and paver installation services to customers in and around Sacramento, Auburn, Roseville and Folsom. Over the years, we have also catered to large number of clients in and around Citrus Heights, Rancho Cordova and Rocklin. Our company has also successfully completed projects in Lincoln, Fair Oaks, Yuba City and the surrounding areas. 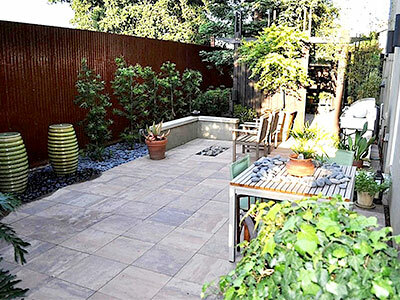 We provide high-quality paver design and installation services. The premium grade pavers we use in our work are sourced from reputed suppliers and manufacturers which will ensure the integrity, stability and longevity of the paved areas of your landscape. We can handle paver installations for patios, decks, driveways, pathways, walkways, entranceways, courtyards, poolscapes and more. The installation is handled by expert professionals with years of experience in the field. We install pavers on a bed of compacted sand, align the individual units perfectly and then seal the surfaces to add to their resilience too. Pavers are very easy to maintain and last for a number of years as long as they are installed by experts like us. As expert landscapers, we have the expertise to design and install various outdoor living spaces such as outdoor kitchens, decks, patios, pool decks, gazebos and pergolas. Our customized solutions help ensure that every feature on your property is designed and built in an expert manner. The best materials and workmanship are used in the work and this ensures the installations are not just aesthetically appealing but very long-lasting too. We take extra care to choose weather-resistant materials as these features are constantly exposed to the elements and have to withstand a considerable amount of wear and tear. Retaining walls are generally built in landscaped areas where slopes have been dug to make space for outdoor features. These walls are built using CMUs; they are very effective in preventing soil erosion and help add to the stability and integrity of the landscape. We have the knowledge, expertise and resources to provide excellent retaining wall solutions that meet the needs of your landscape. Not only do these walls have to be built well but the location needs to be planned properly too for them to be effective in preventing soil erosion. Many areas in your landscape need seating features and it’s why you add outdoor furniture to your patio, decks and lawn areas. You also have the option to get seating walls built in your landscape. These walls typically serve a dual purpose as they perform the function of a retaining wall and provide support to the landscape as well as provide a seating area at specific points in the landscape. These are half-height walls that can be built around a fireplace or fire pit area, along the periphery of a patio, deck or outdoor kitchen etc. For any more information on our products and services, feel free to contact LR Landscaping & Pavers at 916-502-6037. You can also send us queries and requests via this Contact Us form.